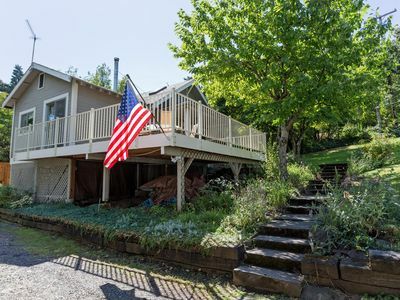 The views do not get better than this spectacular 4 bedroom home in the quaint town of Hood River, Oregon located 60 miles east of Portland in the beautiful Columbia River Gorge Scenic Wilderness. 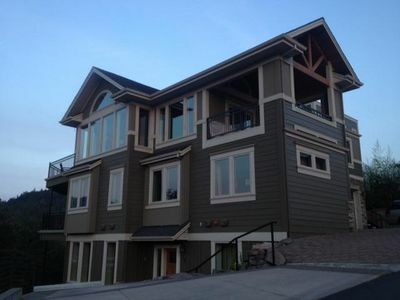 This amazing home has phenomenal views of the Columbia River from virtually every window, some of the best in the Gorge. 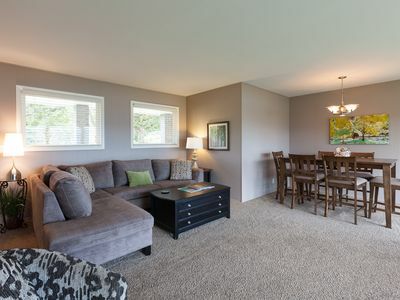 Overlooking the Marina, the "Event Site", the Hood River spit, and the sandy beaches of the Columbia River one can watch kiteboarders, windsurfers, boaters, barges and the Sternwheeler while relaxing on the decks or in the great room. Fly-fishers, can be seen casting on the Hood River and the expansive Hood River valley and Mt. Hood with its year-round skiing can be viewed to the south. This 3800 SF home is features a gourmet kitchen with a commercial Viking range, two ovens, two sinks, and a large granite island. 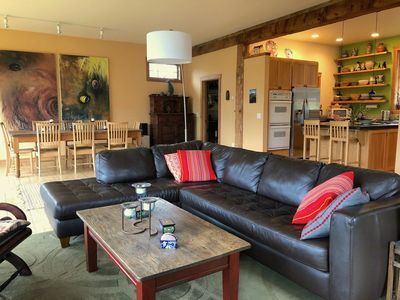 It is open to a stunning great room with high beams, outstanding views, a stone fireplace, and flat screen Satellite TV with Apple TV, DVD, music jack, and surround sound. 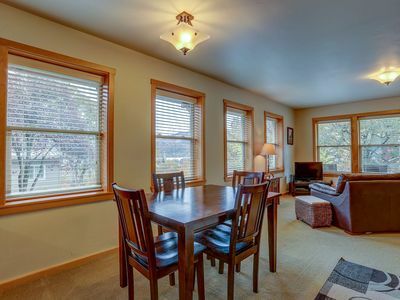 There is a sitting area and large dining table situated in front big view windows. 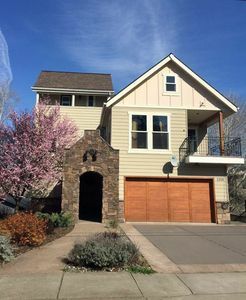 On this level (main living) is a large master suite with a flat screen TV and blue-ray "smart" DVD with surround sound, intimate sitting area, and gorgeous bathroom with a walk-in jetted shower and large soaking tub. A powder room and large office is also located the main level. 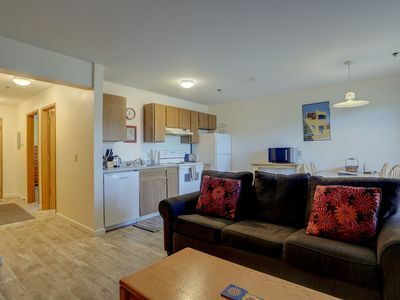 There are three large bedrooms (king/queen/2-double) and two additional bathrooms on the lower level as well as a large bonus/family room with adjoining deck and a large flat screen TV, DVD, and games. 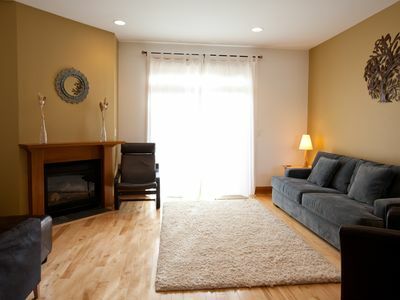 A large laundry room equipped with washer and dryer, drying rack and ironing board is adjacent to the bonus room. 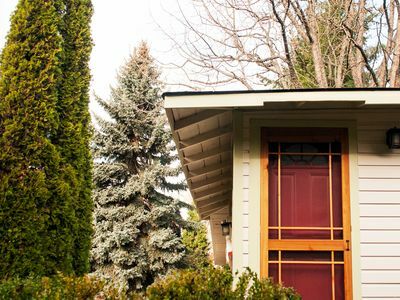 There is a small enclosed loft off the great room that has a comfortable queen futon bed and adjoining deck, which features spectacular views of the Columbia River, Mt. Hood, Hood River, and valley. 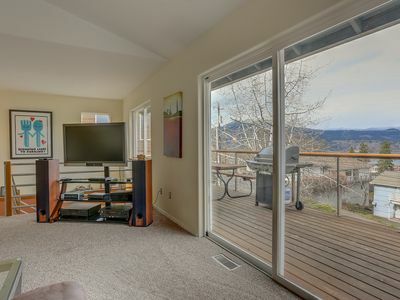 There are two decks off the great room/kitchen including one that is covered. There is foos ball table, dart board, and a ping pong table in the garage. 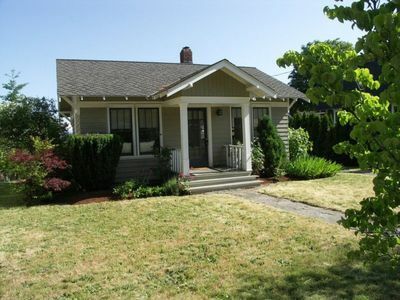 This home is licensed as a short-term vacation rental by the City of Hood River (permit #333). 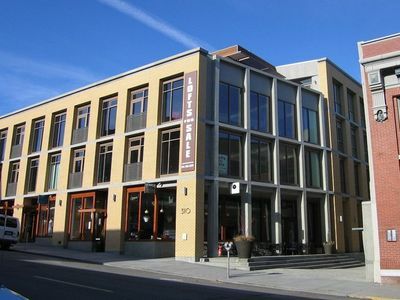 The bustling downtown area is approximately a 5-7 minute walk down the Hood River staircase (two flights of stairs) that leads to the city fountain and rose garden, brew pubs, great shopping, art galleries, fine cuisine, theater, wine tasting, and coffee/internet cafes. The Indian Creek trailhead is steps from our home. 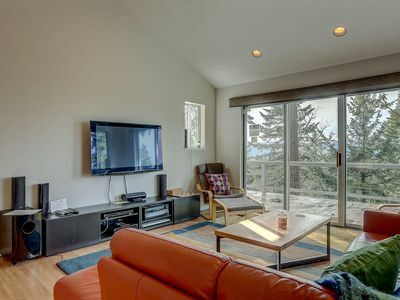 It is a 15 minute walk to the sandy beaches of the "spit" or "event site" kite-boarder launch areas and a 10 minute walk to great fly fishing near the mouth of the Hood. 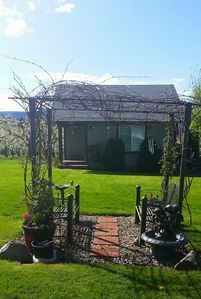 There are several wineries and brew pubs within walking distance and numerous other vineyards with winetasting within a few minutes drive. Mt. Hood Meadows, a winter ski resort, is about 35 minutes south and the historical Timberline Lodge with year-round glacier skiing is a 1 hour drive. Lost Lake and Timothy Lake are within a one hour drive. There are numerous spectacular, scenic routes for road biking and Post Canyon (a 5-10 minute drive) has mountain biking trails for all ages. White water rafting and kayaking is available on the Hood River, White Salmon River (20 minute drive) and the Deshutes River (60 minutes). 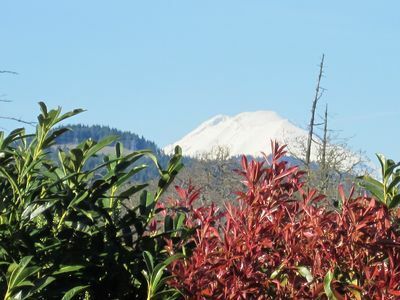 There are numerous options for hiking (refer the internet, Curious Gorge trail guide, or Mark Hatfield/Mosier trailhead State Park Office), windsurfing, kiteboarding, and standup paddle boarding for all levels (The Event Site, The Hook, The Marina, and the Spit are a 1-2 minute drive). Please note that this home may not be appropriate for toddlers. 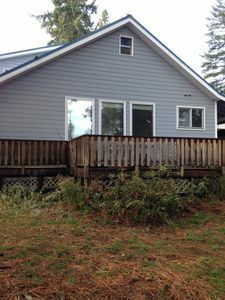 Cozy, Downtown home, amazing deck with a short walk to the heart of Hood River! 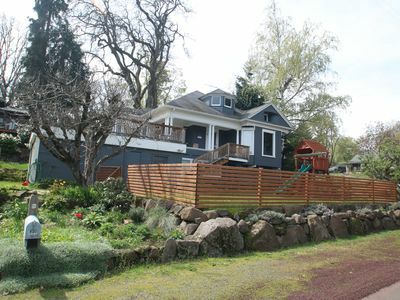 BLUE VIEW 30 Day Min - Ranch style home with INSANE views of The Columbia River Gorge! 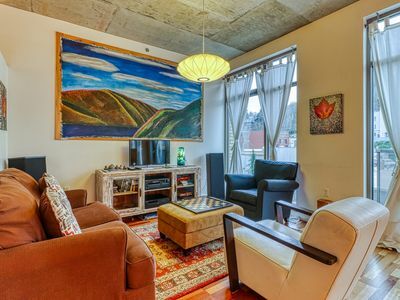 BROOKSIDE - This gorgeous townhome has a downtown location and tons of great features! 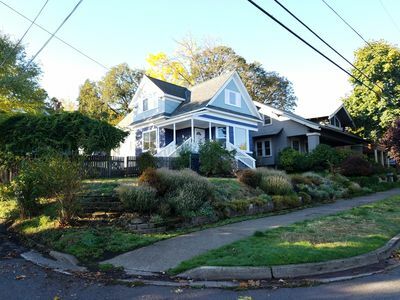 Adorable cozy country cottage for two next to organic vegetable garden! NEW LISTING! 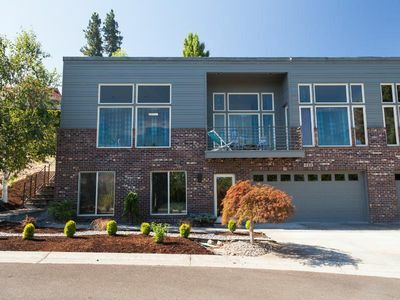 Stunning, updated loft in the heart of downtown Hood River!